HOORAY, Pukeko our new WordPress theme is here! 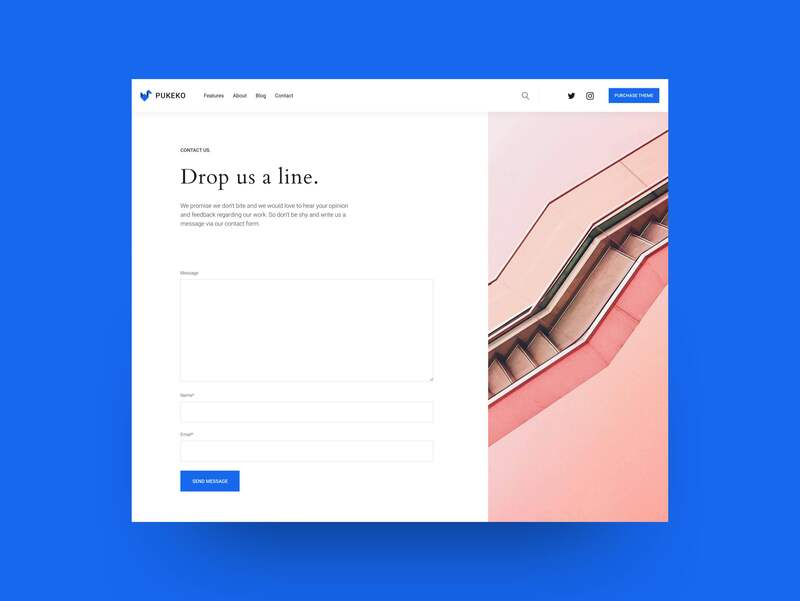 We have been working on this theme over the last few months and are so happy to present our latest work to you today. Pukeko is so much more for us than just our latest theme. 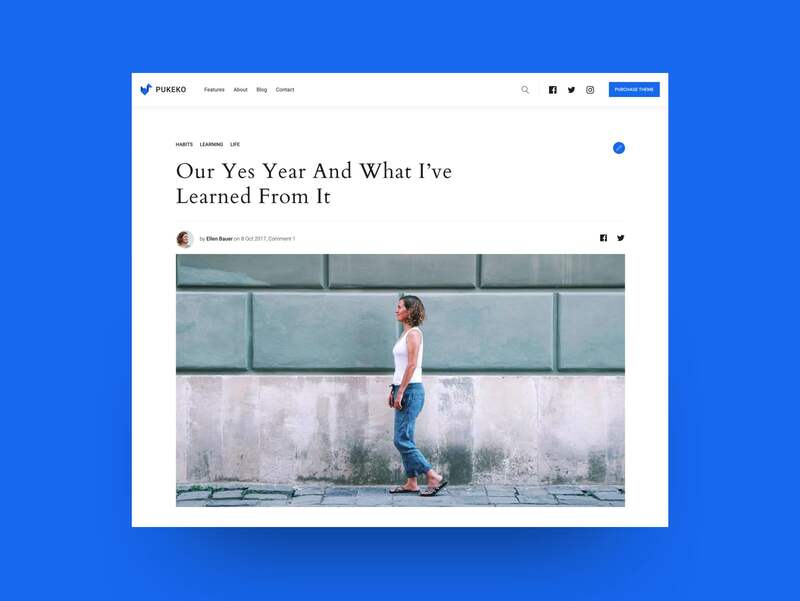 With Pukeko, we have completely redefined our definition of a WordPress theme, how we aim to work with our themes, and how we can evolve them over a longer time period. 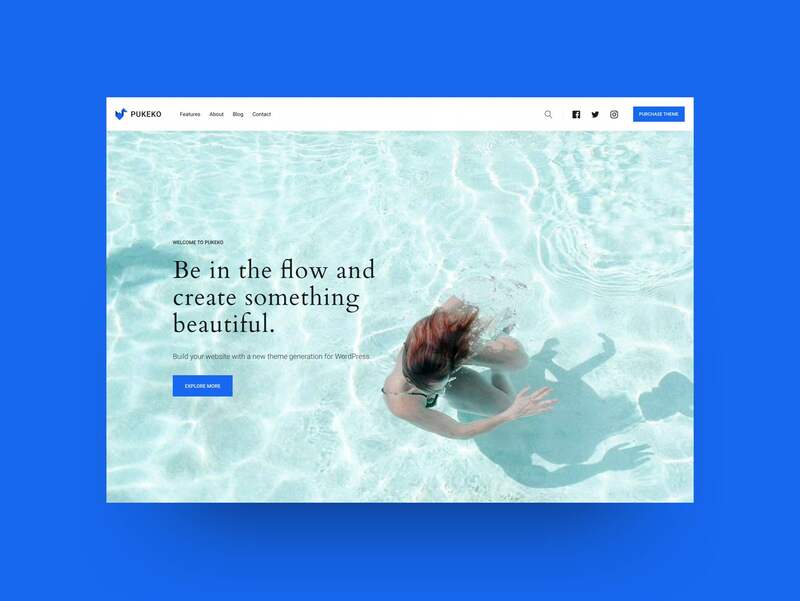 We’ve been creating WordPress themes for quite a while now and in the last few months it has become more and more apparent that we need to rethink our view on WordPress themes. That’s why we took a little “theme release break” to work on something brand new. After countless hours researching and trying many ideas, we have been inspired by new and exciting insights. To top it off, this process has been organic without any stress. The result of this research and re-inventing phase is our new Pukeko theme. And Pukeko is not only a WordPress theme. 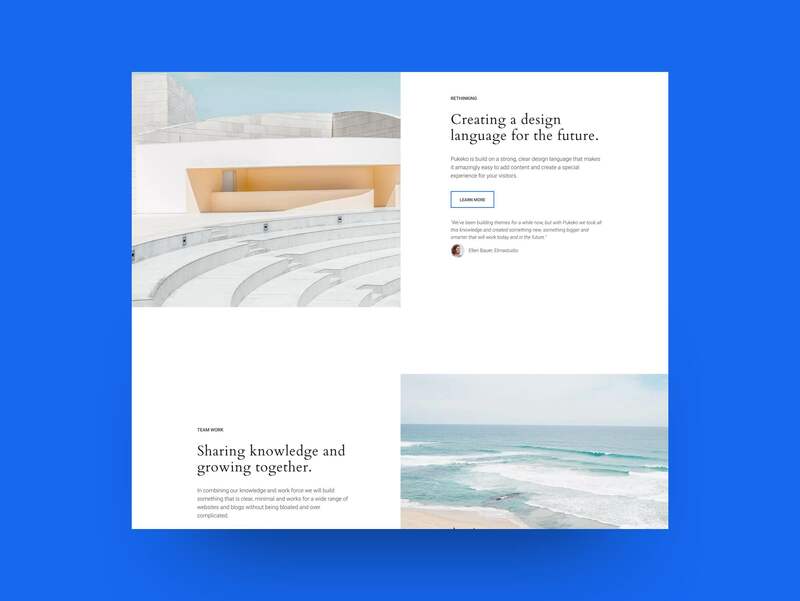 We have also created a complete design system and design language for Pukeko, which provides a solid foundation for everything we will build with Pukeko and in the future. Web design and WordPress itself have evolved enormously over the last few years. Everything has become more complex, but at the same time more flexible, offering a lot more options to create and build with WordPress. Today, there are are so many more possibilities of what you can do with WordPress. At the time we built our first WordPress themes, it was important to us to create with minimalism and simplicity. These values are still important to us today, but we feel that we somehow reached our limits. Although the approach to build smaller WordPress themes, each with one dominant function (blog, portfolio, online shop…) still works for many websites today, there is also the high demand to be able to build larger websites with different sections and functions that are able to grow over time. A theme should be able to grow with you and offer all the freedom to expand your own website over time. We have previously reacted to these needs and demands with earlier themes like Weta or Uku. We added features like WooCommerce support, more customization options, and Front page sections to our themes. With Pukeko, we took our experiences and built something completely new. 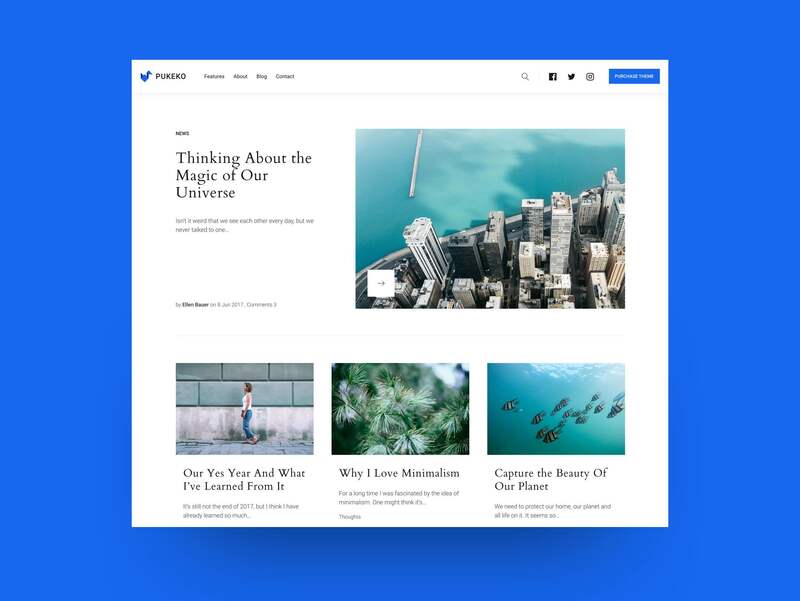 We have created a smarter design and theme system that makes it easier for us and our theme users to grow and build new elements without losing focus on minimalism and a clear design language. The current version of Pukeko is only the beginning. We will consistently add new functions and design elements for Pukeko. We will not only put this philosophy of continued growth and progress into the work on the theme itself, but also into all materials surrounding the theme (such as video tutorials, blog posts, and courses). To stay informed about all Pukeko news and high quality resources, please subscribe to our Elmastudio Newsletter. We have so much more information to share with you about Pukeko. Therefore, we will publish a small Pukeko-related blog post series in the coming days, so we can tell you more about what’s going on behind the scenes and explain all the theme features and plans for the future (Pagebuilder and eCommerce support, plans and thoughts on Gutenberg, upcoming features and improvements we plan to create…). As a first step have a look at the first Pukeko Live Demo. Also, everyone who installs Pukeko will find a helpful Welcome page in the admin area (under Design / About Pukeko) with plugin recommendations and tips to get started. The detailed text documentation and the first video tutorials for Pukeko will also be available today. In the coming weeks, we will build further live demos to show you what Pukeko can do and what kind of websites you can build with the theme. We also want to hear what you think of Pukeko and what questions or feedback you have for us. Feel free to write us a comment below. We are looking forward to hearing from you, exchange our thoughts and answer your questions. I can’t find the pukeko documentation – could you give me the link to it? so sorry for the delay, I’m working on it right now. I will reply to your comment again as soon as it’s available online. the documentations are online now, here the German version and the English version. Thanks so much for your patience and let me know, if you have any questions. Congratulations Ellen and Manuel on another outstanding theme. I can’t wait to see what else you have under wraps. I’d like to see Pukeko principles filter down to Magazine and Ecommerce themes as you create more iterations. You guys must visit London soon and come have a drink. thank you sooo very much for your kind feedback, yes, we will definitely work much further on Pukeko. We plan to support WooCommerce first and then build further blog/Magazine options. Will this be available on wordpress.com? Congratulations Elmastudio (Ellen and Manuel) on amazing work. But the main pagebuilder plug-in, Elementor is not working for me and some others too. And no one is providing any help or guidance on the Elmastudio forum. You have also amended the Pukeko documentation to remove the Tailor plug-in which seemed to work well when I used it. I have not been able to use Elementor to build any pages in Pukeko. Click on the button on a page and nothing happens. Also under settings in WordPress admin, only the general tab opens while the other options do not work. I have also checked my hosting requirements for the Elementor plug-in is adequate. I understand you deserve to rest after all the work you have put into the new theme. But grateful for your help so we can use Pukeko to build great-looking websites. I’m so sorry that you are having issues with Elementor. Do you have the latest WordPress version installed? Also I’m sorry that we have quite a few support requests at the moment, we are working on them. Please allow between 1-3 working days for us to answer. You can also write me directly to explain the issues in more detail to ellen.bauer@elmastudio. If you like you can also provide me with a temporary login, so that I can have a look at your admin area to see, why it’s not working properly. We actually didn’t rest after the theme release though, I’m already working on the next update and video tutorials. Due to our discount, we have more support requests as usual especially on Mondays, since we have to work on the requests from the weekend as well. I will help you asap, if you let me know in more detail, what exactly is not working with Elementor. I will send you a reply to your support requests within the next 24hours as well. did you send a support ticket via the support forum? If so, could you maybe send me the link to it, since I can’t find it in our ticket system. I am so grateful for your prompt replies and offer of assistance. I blame it all on Pukeko being so beautifully crafted. Für mein Betrieb möchte ich eine online-Lehrumgebung einbauen da ich Information/ Erfahrung/Wirtschafftliche Kenntnisse mit einer bezahlten Mitgliedschaft teilen möchten. Ich habe keine Erfahrung mit WordPress aber alles kann mann lernen. Meine Frage ist ob is dass alles mit Pukeko möglich ist? I have tried Pukeko live demo. thanks so much for letting me know. Could you let me know, which browser you are using and if you’re on Mac or Windows? This way I can check everything, it sounds as if this is not intended. is there any update planned for Pukeko (compatibility with WooCommerce, Elementor 2.0, Gutenberg, etc.)? yes, of course. 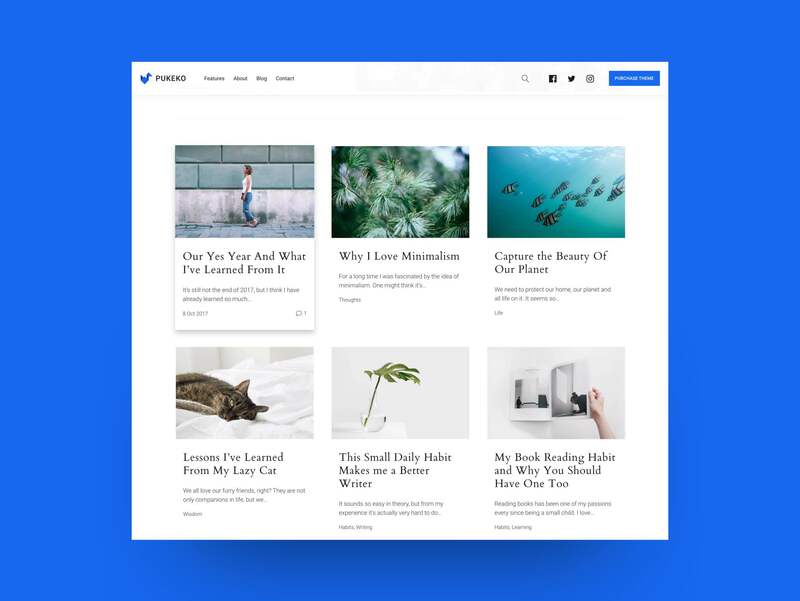 We were holding a little bit back with new, bigger theme releases for Pukeko and new features, because of the upcoming changes with Gutenberg. At the moment we are working on design system improvements and new page designs that will be already Gutenberg-compatible. 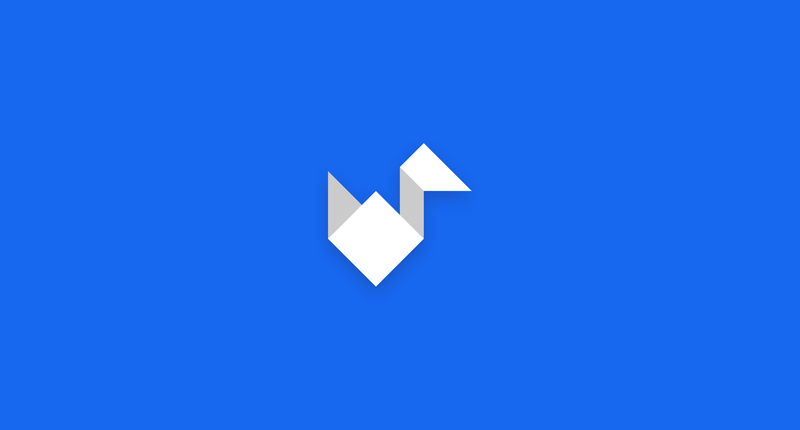 Within this week we will also release a first Gutenberg-supported update for Pukeko. I will write an extra blog post for this release. After this we will also add support for WooCommerce. 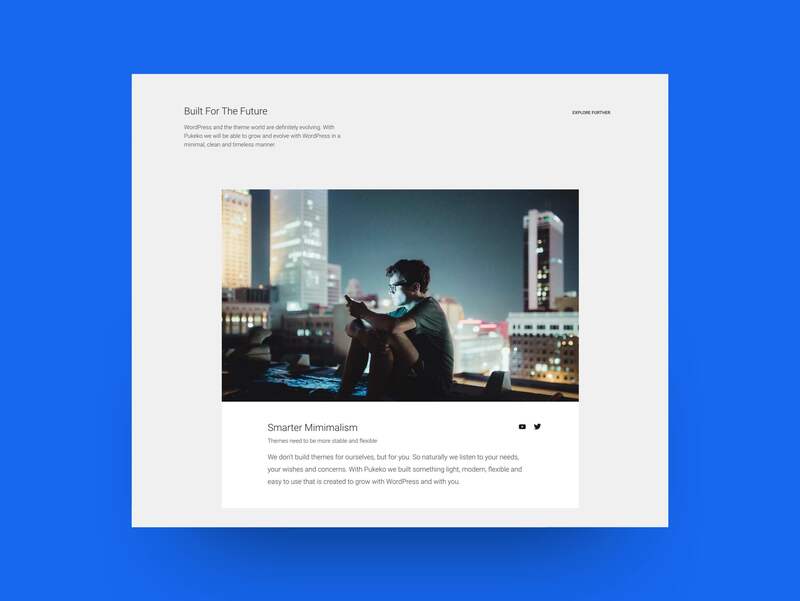 We just wanted to make sure, we create the theme already compatible with Gutenberg before we move further with new features. Let me know, if you have any further questions/suggestions or ideas for updates. At present, today June 21st, what is the best way to make a blog page type ‘magazine’ with Pukeko.? With 3 o 4 columns, and recognising pre-existent posts. Just showing featured image, post excerpts, date, category etc. That’s exactly where I found more difficulties. I have a preexistant web in Canvas Woothemes and looks like the incorporation to your theme is weak. I think that shoul work automatically without Elementor on the way. Could you please clarify for me…?